The frog Huia cavitympanum from Borneo. 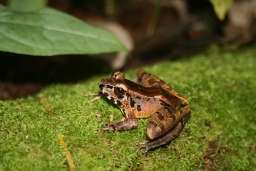 (PhysOrg.com) -- UCLA scientists report for the first time on the only known frog species that can communicate using purely ultrasonic calls, whose frequencies are too high to be heard by humans. Known as Huia cavitympanum, the frog lives only on the Southeast Asian island of Borneo. Ultrasounds are high-pitched sounds more than 20 kilohertz (kHz) in frequency, which exceeds the upper limit of sounds detectable by humans and is far higher than the 5 to 8 kHz frequencies most amphibians, reptiles and birds are capable of hearing or producing. Key parts of the ear must be specially adapted to detect ultrasounds. The frogs can hear sounds up to 38 kilohertz, the highest frequency any amphibian species has been known to hear, the scientists report. Humans can hear up to about 20 kHz and typically talk at 2 or 3 kHz. While most of the more than 5,000 frog species worldwide have eardrums that are flat on the side of the head, Huia cavitympanum has eardrums recessed in the side of the skull, similar to mammals. Peter Narins, UCLA distinguished professor of physiological science and of ecology and evolutionary biology, and Victoria Arch, a UCLA graduate student in ecology and evolutionary biology, spent several nights in the remote area where the frogs live. "We had very little information suggesting that they would be in this location," said Arch, lead author of the study. "We found them our first night out." The study was published April 29 in the online journal PLoS ONE, a publication of the Public Library of Science. Huia cavitympanum produces some audible calls and others that are entirely ultrasonic. "You look at the frog and can see it is vocalizing — you can tell because their vocal pouches pulsate — but you don't hear any sound. It's amazing," Arch said. "Then you look down at the recording equipment and see the lights flashing, indicating sound. I have never seen that before. In a frog, it's unprecedented to have purely ultrasonic vocalizations." Narins and Arch have an idea about why the frogs, which live along a noisy stream, use both ultrasonic communication and calls that are audible to humans. "Our hypothesis is that these frogs have shifted to use higher frequencies in their communication to avoid the interference of sound produced by rushing water in the lower-frequency range," Arch said. "However, high-frequency sounds do not transmit as far. By producing some lower-frequency calls, they can transmit calls over a greater distance, so they can communicate with frogs that are farther away. But by also producing some calls that are high-frequency — all ultrasonic — they may be able to communicate better over that background noise. "Producing both types of calls might be a bet-hedging strategy to be heard," Arch said. "This is how males attract females, communicate with one another and establish territorial boundaries." The research may have implications for improving human hearing aids and addressing hearing loss. Most hearing aids, Narins said, simply amplify sound, including unnecessary background noise. Better hearing aids that are directional, for example, could result from the research. In 1998, Kraig Adler, a professor of neurobiology and behavior who had been Narins' professor at Cornell University, told Narins he should go to China to see "a frog with an ear canal like a human," Narins recalled. Narins took the advice. Along with colleagues, including Albert Feng from the University of Illinois, Urbana-Champaign, he discovered a frog species that lives in rushing streams and waterfalls in east-central China called Odorrana tormota (formerly known as Amolops tormotus). Odorrana tormota, Narins found, could detect and produce ultrasounds due to the highly unusual presence of an ear canal. That research was published March 16, 2006, in the journal Nature. The frogs in China produce very loud calls that are, at the same time, both audible and ultrasonic. In Borneo, however, Huia cavitympanum produces some sounds that are purely ultrasonic. "That was unique — and the first time that has been found in any frog species," said Narins, who has studied dozens of frog species. "We are reporting this for the first time." "With the Chinese frog species, every time you see the vocal sac pulsate, you will hear a sound," Arch said. "With the Bornean frog, sometimes you will see it is calling and you don't hear anything; it's all outside of our hearing range." The frogs in China and Borneo's Huia cavitympanum are the only two frog species known to have recessed ear drums, Narins said. In China, the scientists had set up a loudspeaker in the frogs' natural habitat near a river, then played frog calls and recorded the frogs' vocal responses with a microphone and very high-frequency equipment. Later, they learned of this second species in Borneo with similar ear morphology. Narins and Arch went to Borneo in 2007, and Arch went back last summer. In Borneo, they lived in a camp with a roof and three walls, with one side open. They slept on a wood floor, protected by mosquito nets. Narins was bitten by leeches and woke up several mornings soaked in blood. They ate noodles and peanut butter. "It was a huge adventure, and so exciting to study the animals in their habitat," Arch said. "You feel like you're eavesdropping on them." "There are not many places on the planet left that are so pristine and untouched by humans," Narins said. "It's exciting to go there and wonderful to have a sense of discovering something brand-new. We were there a week and saw only two other people." Arch and Narins studied male frogs. In the majority of frog species, the females do not vocalize, and when they do, they do so less frequently than males, Arch said. More information: The research article is available at http://dx.plos.org/10.1371/journal.pone.0005413. Was I the only one who thought of the HypnoToad when they read this article?